What Does a Direct Support Professional (DSP) Do? 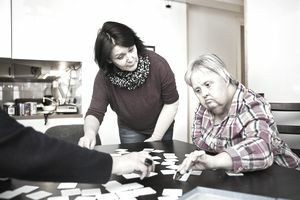 Individuals with intellectual and developmental disabilities (IDD) need people in their lives who provide them with assistance and instruction on completing tasks that most people take for granted. Professionals who provide this help and training are known as direct support professionals (DSPs). DSPs provide aid to people who suffer from a variety of disabilities and across a wide range of tasks, including transportation, personal care, cooking, and cleaning. The goal is to help people with IDD achieve a more comfortable level of independence. Keep the patient safe from health hazards. For example, a DSP would keep sharp knives in locked drawers and store household cleaners in locked cabinets. Monitor individuals’ behavior toward themselves and others, and maintain patients' records of problems and progress. Report any instances of suspected abuse, neglect, or exploitation to the appropriate authorities so that protective services specialists can investigate the situations if necessary. Help individuals with tasks like cooking, cleaning, showering, toileting, shopping, and managing money. Teach patients tasks that they can ultimately learn to do for themselves. DSPs can work with adults as well as children. In some cases, they might be authorized to administer medications. Individuals with IDD and DSPs often feel a great sense of accomplishment when an individual learns to complete a new task. People don't become DSPs for the money, but the personal gratification can be top-notch. Two significant factors contributing to low wages for this profession are the minimal amount of education required and a high turnover within the workforce. In many cases, employers provide all the training new hires need, which is often extensive. But experience and education can be invaluable when you're trying to find a job in this field. Education: The most common educational requirement for DSP jobs is a high school education. Experience: Two-plus years' experience is usually preferred. New Employee Orientation: Employers typically provide training in CPR, behavior management, occupational safety, abuse, neglect, and exploitation. Voluntary Certification: Certification is available through the National Alliance for Direct Support Professionals (NADSP). It's generally not required, but certification can increase your chances of being hired if you take this extra step. Most employers require that DSPs be at least 18 years old. They should have current drivers' licenses and be able to pass a criminal background check and a drug test. Composure under pressure: These individuals need the help of their DSPs, and sometimes they can't always express their discontent, unhappiness, or frustration in productive ways. Dependability and punctuality: Unexpected absences and showing up late can disturb patients who depend heavily on predictability and sameness of routine. Keen sense of observation: A DSP should be able to tell when something isn’t right with the individual he serves. Other DSPs, medical professionals, other individuals, and family members might be able to shed light on the situation when a DSP can't put her finger on what's wrong. Interpersonal skills and a strong sense of teamwork: These characteristics help DSPs deal with the challenges of the work and make them good co-workers for other DSPs. Because the turnover rate is high among DSPs, employers sometimes need to fill vacant positions quickly. There is typically ample work available. DSP jobs are available in both the public and private sectors. DSPs are often employed at state-run institutions where individuals with IDD are residents. Some of these patients work with DSPs to learn the skills necessary to live in settings like group homes and assisted-living facilities. Other DSPs serve individuals in their homes. Challenges can come from just about every facet of the job, but the job is rewarding. A DSP's hours can be erratic, but it can depend on whether you're working in a private home, an institution, or other employer. A minimum of 40 hours a week is generally required, but some agencies do offer part-time positions. This is usually a daytime job except when patients have emergencies. Co-workers might not show up, causing you to work longer hours than you expected. Individuals might exhibit violent, self-injurious, or destructive behaviors, so you can't leave at your regularly scheduled time. Talk to someone in the field who can share his experiences, give you an idea of what you can expect, and guide you to potential job openings. The National Alliance for Direct Support Professionals (NADSP) offers a national certificate program for people who want to specialize in this field of human services.